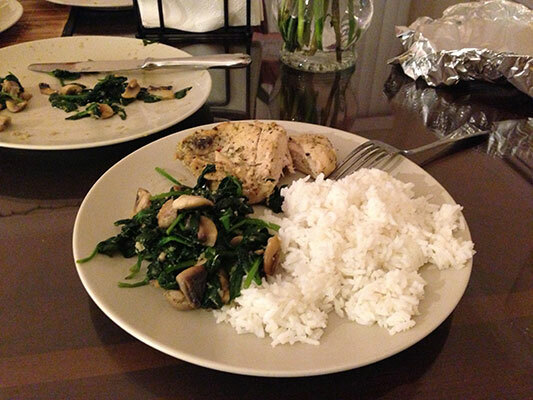 Pressure cooking chicken breasts is my favorite way to cook them, because they’re tender and juicy every time. 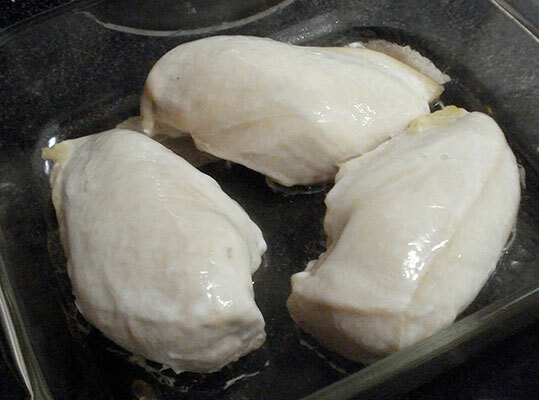 Sometimes I’ll cook a large batch of chicken breasts for a large single meal or multiple meals. You can even cook just a couple at a time in your pressure cooker. The chicken can then be used in any recipe. If you purchase a large pack of chicken breasts with the bones and skin included, the price drops considerably. You won’t be paying for the extra processing, but you will be paying for the weight of the bones and the skin. However, when you cook your chicken with the bones and skin, you’ll be imparting more flavor and juiciness to your meat. Start by adding the two cups of water to your pressure cooker. As mentioned in the ingredient list, you may substitute chicken bullion, or chicken broth, or chicken stock. Insert a rack into the bottom of your cooker to keep the meat off the bottom. Add your 3 to 4 pounds of thaw raw chicken breasts to the pot. Set and cook your electric pressure cooker at high for ten (10) minutes. When the cooking timer is done, use the quick-release method to relieve the pressure so that it doesn’t continue cooking. Cut through the center of one of the biggest pieces and visually check it to see that it’s completely cooked through. Just make sure that there is no visible pink left. To be sure, insert a temperature gauge into the center of the largest piece to make sure that it’s reached a temperature of 165 F (75 C). At this point the chicken is fully cooked. The fat will have been rendered out of the chicken skin and the meat is completely cooked. You may now very easily tear the skin off and dispose of it, or you can grill or broil the breasts for a few minutes while marinating with your favorite sauce and crisp up the skin. You may also cube it into a salad or casserole, or shred it to be used with tacos or another dish of your choosing. You may even choose to freeze a portion of it for a later meal. Another idea is to just dice up the tender and moist chunks into a salad, shred it for tacos or for chicken salad sandwiches. Cooked chicken can be used for anything you can think of. The best part is that it’ll be tender and juicy, not dried out. Should I Remove the Skin Before Or After Cooking? Some people want to eliminate as much of the fat as possible and will buy skinless chicken, or will peel the skin off before cooking. This is entirely a personal preference, of course. Pressure cooking chicken breasts will greatly help to keep them from drying out if you wish to cook your chicken skinless. 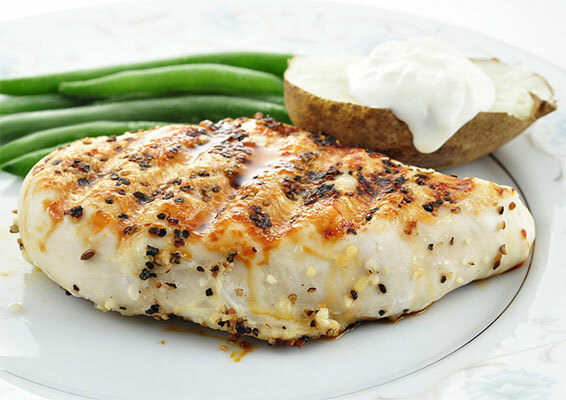 A skinless chicken breast does contain less fat and calories. However, if you cook your chicken with the skin on, then remove it before eating, fats from the skin will enhance the flavor of the meat and help to keep it moist, but will limit the saturated fats you consume. For a long time, the saturated fat from the skin of chicken has been demonized, however, recent studies are showing diets that are high in saturated fats and unsaturated fats, but low in refined carbohydrates, clearly show a positive effect on blood lipid content that greatly reduces the risks of heart disease. This new evidence shows that the over consuming of sugars and other processed carbohydrates (things that readily break down into sugars in the body) are the real culprits behind cardiovascular problems, inflammation, weight gain, diabetes and many other conditions. Moderate amounts of fats in the diet are necessary for the delivery of fat-soluble vitamins to your cells. Trans-fats ( hydrogenated fats) should be avoided outright, as they are an unhealthy fat. It’s exciting to see new scientific evidence focusing on the true reasons contributing to the diseases caused by western diets. Finally, the untruths of the sugar and agro industries are finally being exposed. Seasoned and crisped chicken skin can be delicious. If it’s crisped good enough, many consider this the best part. During cooking, you’ll render much of fat out of the skin, which will help to flavor and moisten your chicken meat and the broth. If you’re cooking with the bones too, tremendous flavors will leach from the bones, flavoring your chicken and the liquid stock. Your chicken will be moist, juicy and very flavorful. The stock can then be thickened with corn starch, if you wish and used to flavor side dishes such as vegetables and rice, or potatoes. Many chefs and cooks will use the terms Stock and Broth interchangeably. But some are adamant that they are two different things. A ‘broth’, they say is made when meat, with or without vegetables, is simmered in water to extract the flavors. A ‘stock’, they say, is made when meat with bones are simmered in water, also with or without vegetables to extract flavors, for the purpose of making soup, or for thickening as a gravy to flavor side dishes. Simply put, if the meat was simmered with bones, it is a ‘stock’. If the meat was simmered without the bones, it is considered a ‘broth’. Check out our other favorite Pressure Cooker Recipes. More are to come! Learn more about Your Pressure Cooker. I have a pressure cooker that is literally stove-top, not electric. It was my daughter’s and she bought an instapot and gave me her cooker. She did not keep the instructions and I do not know how to set the cooker for large chicken breasts-bone in, skinless. Can you please, please help me? Hi Paula, Thanks for the question. 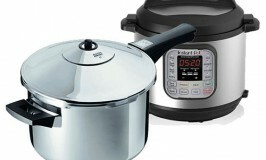 There are numerous brands of stovetop pressure cookers, but they all have the same functionality. You can adjust them for higher or lower pressures and with that, the temperatures. The trick to cooking chicken so that it’s moist and tender is to cook it at a lower temperature for a longer period of time. Cook times are dependant on how much you’re cooking at a time and whether it’s fully thawed. Say you want to prepare about 3 lbs. of bone-in chicken breasts. I would add about 2 cups of water or broth to the pot. You may coat the meat with your favorite chicken spice. Mine is Kick’n Chicken. Moisten the meat, so the spices stick, then season it. Salt, Paprika, Thyme, black Pepper, Rosemary, Garlic and Onion are awesome spices for chicken, but use what you like. If you don’t want your chicken to fall apart, you might want to stack the chicken on top of a rack (trivet) within your pressure cooker, or you may partially submerge the bottom chicken pieces in the water. It’s not a big deal. Put on and seal the cover and put on the pressure regulator for high pressure. Heat the pot over high heat. When the pressure and temp start building up, steam starts venting from the regulator. When steam starts venting strongly, reduce the burner to medium-low. Adjust the heat so the regulator is venting moderately, not violently. Once it reaches this point, cook it for between 15 and 20 minutes, then remove the pot from the heat. Move the pot to a cool part of the stove and wait for the pressure to vent naturally. Once the pressure is fully relieved, you may safely open the pot. Your chicken target temperature is 160°F at the middle of the fattest part of the chicken. I’m certain you will come to love your new pressure cooker. Good luck and have fun! I just got my pressure cooker and I have a lot of learning to do. I have been enjoying your website. I was just reading about cooking chicken breasts and saw that you say to put a rack in the bottom. Mine did not come with a rack. Any rack? I haven’t seen that mentioned before. Thanks for your website. I will keep coming back. How exciting to start exploring with your new pressure cooker! Congratulations! I have seen chicken breast recipes that will call for a rack in the bottom of the rack, to keep the meat out of the liquid, and I’ve seen recipes that say to put the chicken breasts right into the liquid. Not everyone explains why, I’ve noticed. The reason why I put a rack in the bottom of my pressure cooker when cooking chicken breasts, is to keep the chicken off the bottom, away from direct contact with the heating element underneath. Chicken that’s cooked within the liquid will have more of a tendency to fall apart and not stay together. If after cooking, you’re going to pull it apart and shred it anyway, it wouldn’t matter if it the meat falls apart. That may even be preferable. On the other hand, if the chicken is going to be the main course, you may want them to maintain their shape. They’ll have a better chance of doing that if you use a rack. You may want to experiment and see what works for you. 2. Don’t drown it. Use just enough liquid that your pressure cooker requires to build pressure, or the flavors will be diluted.